Red Rag at Red Barns? Last year, the otherwise excellent cycle path along McMullen Road was cruelly interrupted by the installation of the above barrier. Just when the Campaign thought that such needless interruptions had become a thing of the past, this appeared. The logic is sadly obvious. Cyclists approaching this point from the south are riding down a relatively steep incline. Here, they cross a side street into the Red Barns estate. Because of the incline, it has been deemed insufficient for cyclists to have a “give way” sign painted on the cycle path. So a barrier has been installed. Apparently, this followed an accident, though details have so far not been forthcoming. So why is this junction dangerous? The only reason that there is any danger is the totally obscuring fence that the residents have been allowed to build, and which can easily be modified so that emerging drivers can see the path, but passing pedestrians and cyclists cannot look into the adjacent property. When we took the above picture we witnessed the result – a young cyclist simply jumped the pavement 20 yards uphill and continued his journey on road, rather than stopping and negotiating the barrier. This stretch of cycle path was the subject of Campaign consultation when it was first mooted a few years ago. At that time, we urged the council to begin the process of driver education by giving cyclists right of way at this junction. The reason was simple. The side road is in fact a private cul-de-sac servicing a handful of houses. Traffic is so light that even the most dedicated petrolhead could not argue that giving way to cyclists constituted a great inconvenience. And without the obscuring fence, there would be a perfectly clear view between cyclists and any emerging vehicle. To many, this might indeed seem like little more than an inconvenience to cyclists. But the philosophy behind its construction is deep rooted in the average British traffic planner’s psyche. As the little inconveniences aggregate together into a giant pain in the bum, it is little wonder that the UK continues to be a world loser in the cycle rates league, and a world leader in the crap infrastructure league. Next week (Thursday 20th January, 6.15pm in the Town Hall), the Campaign will be bringing our views on this little gem to the council’s next Cycle Forum. This is open to anyone with an interest in cycling, so please join us if you can. Whinfield Road – A Step Forward? Darlington Cycling Campaign was recently consulted on proposals to develop new cycling infrastructure in the north of the town. Such consultations occur on a regular basis. but what makes this particular proposal exceptional is that it is the first that is being made on a busy arterial road, Whinfield Road, and will involve the reduction of space for motorised traffic in favour of cyclists. The map here shows the proposed stretch in red, connecting existing routes marked in yellow (advisory) and green (actual cycling infrastructure). For some time now, we’ve been arguing that more visible, and more direct cycle routes are needed if more people are to get on their bikes. The core of the local authority’s strategy had been to try to avoid busy roads altogether by developing signed “alternative routes” on quiet side roads. 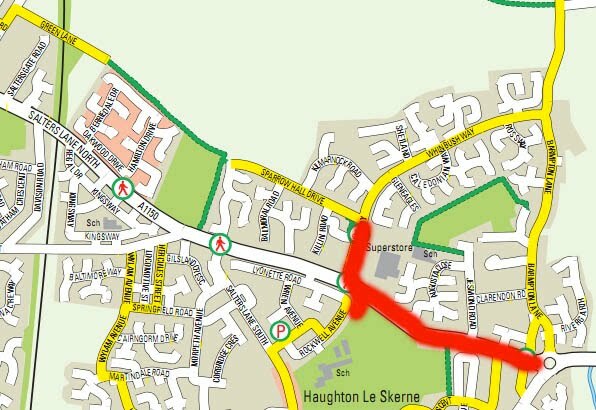 Thus, rather than cycling down North Road, we are encouraged to use the signed route down Pendelton Road, running parallel. The advantage is that a series of signs are relatively cheap to install, legally simple, and of course they do not incur the wrath of the motorist by threatening their road space. The disadvantage is that they can be, as is the case with the West Park route, somewhat roundabout, and still requiring the use of relatively busy roads. 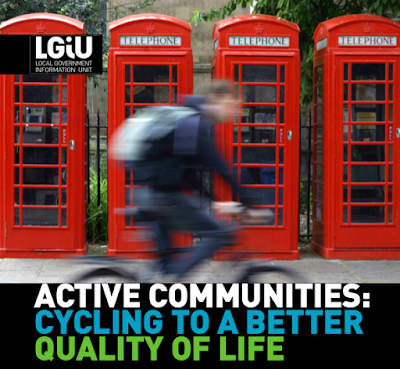 The Cycling Campaign believes that the UK needs to adopt the best and most successful European practice. Cycle routes should be direct, continuous and safe. This therefore requires the best infrastructure to be developed where traffic is heaviest, and where cyclists are most likely to want to travel. So for example Parkgate, between the railway station and the town centre, should be the “dual carriageway” of cycle routes. It is one of the busiest roads in urban Darlington, yet one of the key cycle routes for everyday cyclists. So it is good to see the local authority taking an important step forward by tackling one such busy road. The process is still in its early stages, and we cannot yet predict whether existing plans will in fact be carried out, or what opposition might lie around the corner. We have expressed our own views about the proposals. 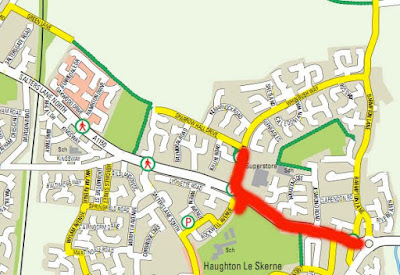 The off road cycle path proposal between Sparrowhall Drive and the Haughton Education Village is an excellent addition to safe routes to school in the town. However, the proposed on-road cycle lane along Whinfield Road itself, from Whinbush Way east to the Stockton roundabout, whilst commendably reducing space for motorised traffic through the elimination of central hatching, is only advisory. It is interesting to consider why. The satellite image above shows a short stretch of Whinfield Road, where the proposed new cycle route is to be developed. As with much of the road, there is ample space for an off-road cycle path on either side of the carriageway. On busy main roads like this, with significant HGV traffic, this is our preferred option. Subjective safety is crucial if we are ever to attract people who don’t cycle now, to use such roads. This option has been rejected on grounds of cost. 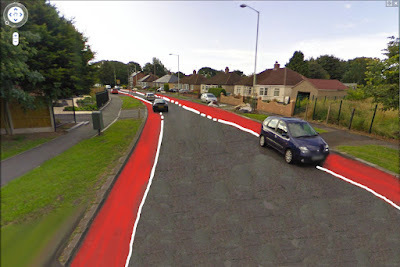 Our second preferred option, at least as an interim solution, would be an onroad mandatory cycle lane, something along the lines of our artists’ impression below. Since there is ample off-road parking, this would surely be a solution that offers a small degree of subjective safety to cyclists, without the recurring problem of motorists parking on the cycle lane (which would, unlike an advisory lane, be illegal). However, even the cycling community appears to be somewhat unclear about a way forward here. The objection put forward by the local authority is that such a lane would prevent motorists from accessing off-road parking, since they are legally not allowed to cross the continuous white line. This reasoning was confirmed when we asked Sustrans. Yet it seems a great pity that arguments about the legality of crossing a white line at the side of the road (think of these lines along the side of that other busy road we have surveyed in the past, the A167 to Newton Aycliffe) can prevent rational discussion about best practice. These kinds of rules existed in Germany. They got round them by amending the law and introducing different widths of continuous white line for these new circumstances. These can be crossed by motorists wishing to access parking spaces. In fact, to return to the need for continuity, good cycle routes can embrace both off-road cycle paths and on-road mandatory cycle lanes, as long as the one seamlessly transfers to the other. 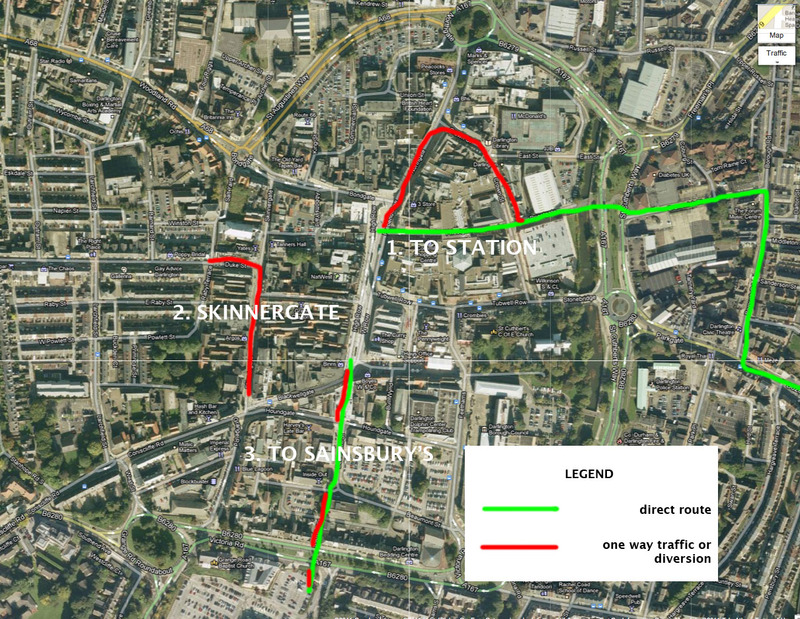 There is no good reason why certain sections of this route, where most appropriate, run behind parking areas, whilst others run between parked vehicles and moving traffic. There are examples of such situations in the council’s proposals, but the “advisory lane” approach inevitably means that cyclists again have to give way to motor traffic. 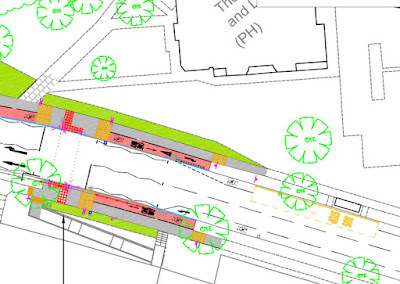 Rather than continuing on their own dedicated and protected cycle route, they are deemed to be “re-joining the carriageway”, as in the detail from the proposals below. The irony of all of this concern about crossing white lines to park a vehicle is that the supposed “hierarchy of road users”, which places pedestrians and cyclists first and private motor vehicles (and particularly stationery ones) last, is turned upside down. New infrastructure has to be designed around the needs of those wishing to park their private vehicles along the public highway. We all know how much there is still to do in the UK to encourage cycling. So we should give credit to Darlington Borough Council for tackling a difficult but important stretch of road. But perhaps David Cameron should take a leaf out of his own policy book, and ask his Ministry of Nudging to shove an elbow the way of his Transport Secretary, Mr Hammond, and ask him to sort out his white lines. 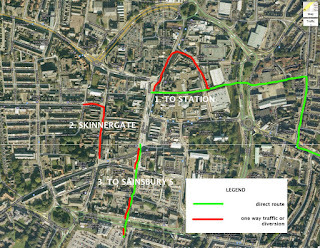 EDIT: To add yet another model to this debate, have a look at this proposed new cycle lane in Cambridge. The Cycling Campaign there have also expressed concern about motorists parking on advisory cycle lanes. Here they proposed, and appear to have won, the idea of double yellow lines along the length of the cycle lane. Come along to Darlington Cycling Campaign’s Pedal Picnic this Sunday! The pedal picnic is an alternative to a “critical mass“. The aim is to stimulate discussion on cycling around Darlington using the infrastructure that we have. It is designed for everyday cyclists, and is more a social, rather than a sports, event. Meet at the Arts Centre, Vane Terrace at 1pm(1300hrs) this Sunday (22nd August). Bring a bike, some food or food to share and some waterproofs,just in case of inclement weather. The route I have in mind and have already “test” ridden, is to leave the Arts Centre and head to Cockerbeck Park/LNR, using the advisory route(yellow) on the Tees Valley Cycling map, Darlington. On leaving Cockerbeck, we shall cycle around the edge of Branksome until the off-road cycle path is reached. This path is then followed to Westpark where we shall stop and picnic. After the picnic the route follows West Auckland road, on the roadside cyclepath, until the junction of Brinkburn Road. We’ll then follow the advisory route back to The Arts Centre via Willow Road, Pierremont Road, Pierremont Crescent, Millbank Road, Cleveland Avenue, Trinity Road and ending back at the Arts Centre. For those who would like to join a critical mass ride, the nearest event is organised by the soon-to-be-born Newcastle Cycling Campaign on the last Friday of every month. Edit: A low turnout, but a lovely day. Darlington will always be in the forefront of the “slow town” movement, so these things will take time to develop. Unperturbed, the organisers are meeting on 31 August to plan the next ride. Watch this space!